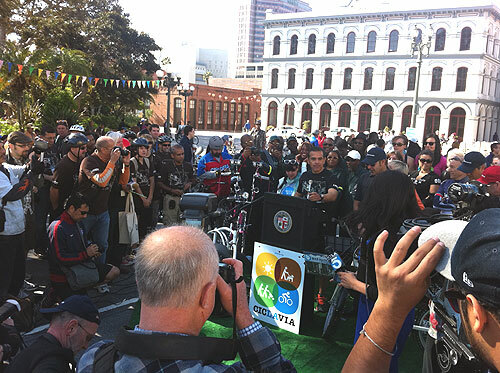 Mayor Villaraigosa Announces Major Bike Sharing Program for Los Angeles. 11 a.m. — CicLavia just started an hour ago and already there has been a major announcement from L.A. City Mayor and Metro Board Chair Antonio Villaraigosa: a private bike sharing company will soon be coming to L.A. with 4,000 bikes and 400 stations. At a 9:30 a.m. press conference near Olvera Street, the mayor unveiled plans by Bike Nation, a local bike sharing company, for a $16 million bike sharing program over the next two years in downtown L.A., Hollywood, Playa Del Rey, Westwood and Venice Beach. “Whether your destination is work, a train, a bus or your local restaurant, these bikes will get you there. Bike Nation’s new venture reflects a sea-change in our city,” the mayor said. 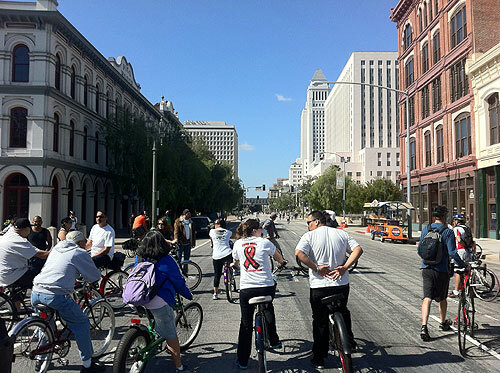 Cyclists get ready to begin CicLAvia Route on Main Street. This is fantastic. I hope we can get one in Pasadena, too. A bike share program is a great compliment for those who primarily use Metro and a carshare like, LAXCarShare. I wonder how the independent bike rentals along Venice Beach feel about this new program. I suspicious of Bike Nation. They were the only one of the three bike sharing companies that did not have a finished product at the Metro demo, with bikes that did not seem to be well thought out, and at CicLAvia their bike rentals looked like beach cruisers. The company also has yet to have any installations. There is also the problem with promising to have bike rentals at five different geographical areas that are several miles apart from each other. That dilutes the usefulness of renting a bike to a customer, with sparce kiosks spread far apart and this makes it tougher to fix the bikes or move them around without encurring much higher costs. Nothing has been said on how they are going to make a profit. Most private bicycle sharing systems that break even or make a profit are supported by bike sponsorship and or advertising at the kiosk, which is the way Alta Bicycle Sharing will work for no cost to the government of New York City and why JC Decaux is supplying the Velib bicycle sharing system free to the government of Paris. It is exciting to get a bike sharing program, but also disappointing that all the effort seems focused in the upper/middle class and/or touristy areas only, leaving out working class and lower income communities where there is also much need. I’m interested in seeing if the program will eventually be expanded to other areas as well.